TheCityFix’s 2014 People-oriented Cities series shows the blueprint for connected cities with high quality public transport, mixed-use transit-oriented development, and walkable and bikeable neighborhoods. Photo by Mariana Gil/EMBARQ Brasil. Transport and urban development are inherently linked. Though the majority of residents in many of the world’s biggest cities do not own a car, cities are often designed around the needs of automobiles instead of the needs of people. In Mexico, less than one-third of urban trips are made in cars, yet three-quarters of the federal mobility budget goes to highways. This can lead to urban sprawl, congested, unsafe roads, insufficient access to public transport, and a lack of public spaces. However, a clear set of strategies is emerging to design cities around the needs of people instead of cars. TheCityFix’s 2014 “People-oriented Cities” series explores the recipe for controlling car use and shaping urban development around sustainable transport. By promoting compact and mixed-use transit-oriented development (TOD), investing in quality public transit systems, and making cities walkable and bikeable, cities can save residents time and money while improving health, economic opportunity, and quality of life. Cars will likely always play a role in urban transport, at least for the near future. The first step to fostering more sustainable urban development is effectively managing their use. More cars lead to more challenges for cities including road fatalities, traffic congestion, longer commuting times, and more air pollution. Cities can curb car culture using strategies like a congestion pricing scheme, restricting parking, and designing safer streets by narrowing lanes or prioritizing pedestrian crossings. Using these transport demand management (TDM) strategies is an important first step that allows cities to integrate cars into a network of sustainable mobility options, rather than allow car-use to shape urban development. As cities deal with rapid urbanization, they often expand outwards. Residents on the outskirts of Mexico City, for example, spend as much as 2.5 hours commuting each day. By integrating land use and transport planning, however, transit-oriented development (TOD) can help reverse this trend and create more livable communities. This planning strategy calls for dense, mixed-use urban development around transit hubs with high quality public transport. Using codes and zoning regulations, encouraging density and mixed-uses around transit hubs helps create demand for transport services, making high quality transport systems financially viable. Transit-oriented development also ensures that transport services are accessible to more people, connecting communities and expanding employment opportunities. Fostering dense, mixed-use communities also creates local social and economic benefits. By integrating commercial and residential building, this urban design strategy reduces the need to travel long distances, saving residents money and reducing the strain on transport systems. It also can be a boon for local businesses by increasing foot traffic. Transport for London found that pedestrians spend up to 60% more money at businesses each month than those traveling by car. Combining mixed-use development with pedestrianization amplifies these benefits. Finally, mixed-use communities bring shared community spaces that foster social interaction. In addition to supporting dense, transport-friendly neighborhoods, cities should ensure that neighborhoods have good conditions for walking and biking. Supporting these forms of active transport creates a number of benefits for cities such as relieving traffic congestion, reducing local air pollution, improving traffic safety, and increasing physical activity. Three design principles are central to encouraging walking and biking: connected streets, car-free streets, and active streets. A network of connected streets ensures that neighborhoods are linked. Car-free streets can become anchors of human-centered activity, providing commuter facilities and supporting recreation. 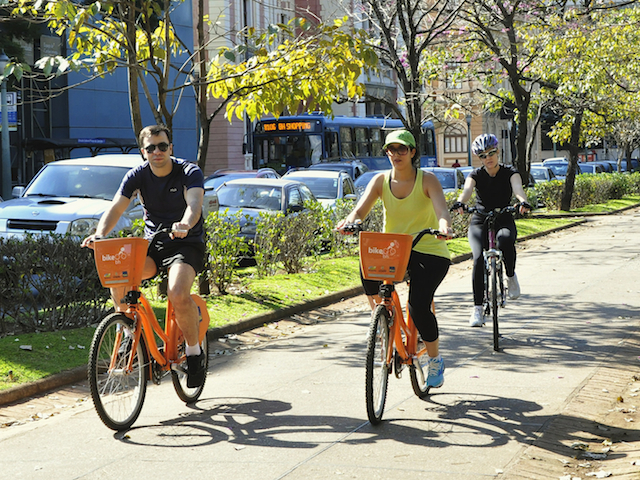 Active streets involve protected and separated spaces for pedestrians and cyclists. Many cities are experiencing rapid urbanization and rising demand for car ownership. The way cities manage transport will have a dramatic impact on the way they develop. Using people-oriented strategies, policymakers can prioritize growth that fosters public instead of personal transport, connected communities instead of sprawling ones, and inclusive urbanism instead of separated cities. It’s time for the world’s cities to focus on moving people rather than moving cars. Stay tuned for future installments of the People-oriented Cities series in 2015, and see EMBARQ’s Transit-oriented Development Guide for Urban Communities to learn more about building cities for people, not cars.